We reported earlier today that Apple has kicked off its marketing campaign for iPhone 11 with a short video that emphasizes the fact that iPhone users can feel safe about sharing their private data on an iPhone. Unfortunately, Apple didn’t reveal the design of iPhone 11 or what kind of features the next-gen handheld device will have to offer which leaves us to speculate. Talking about iPhone 11’s design, the Japanese publication Macotakara which specializes in smartphone leaks has released a new mockup of iPhone 11. The folks at Macotakara are saying that their mockup of iPhone 11 is based on the information provided by Apple’s Chinese tech supplies. With that said, let’s see what features we can pick out from the mockup. 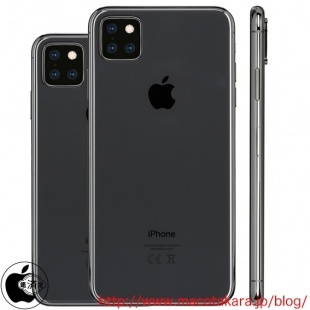 iPhones have always been known as camera-centric devices and therefore, it should come no surprise that the iPhone 11 mockup features a triple camera-setup that is paired with a LED flash. What’s interesting is that the camera-setup has a bump. This is a design problem because iPhone 11 users will end up scratching the camera every time they place the device on a hard surface. The only way to avoid this from happening would be to use a special case. Leaving the impressive camera-setup aside, what we can notice in the iPhone 11 mockup is the fact that the handheld device is going to be available in two different sizes. This is the norm with all iPhones and the only exception to this rule are iPhone X and iPhone XR. In addition, the two iPhone 11 variants will not only differ in size, but they will also feature different internal storage spaces with the smaller variant being rumored to feature 64GB.